The Facebook Group, The Shareable Clique, is an invaluable resource for social media librarians. 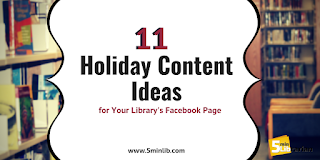 It is the perfect place to go to find viral content perfect for your library's page (and to share content that has done well on yours, too!). Since the holidays are right around the corner, we thought we'd give your page a head start with posts that have been shared. NOTE: Make sure you share directly from the source (i.e. the library's page), NOT from The Shareable Clique or you'll get the wrong description above the photo/link.) To do that, click on "post" at the top, next to the poster's name. 1. Who doesn't love a book tree? Over 400 books were used to create this 6 foot beauty! 2. And don't forget the other holidays! You can recreate the menorah with just 9 books! 3. For those snowy days, you could run an informal poll: "Would you rather be stuck in a snow storm with only fiction or nonfiction books to read?" 4. Feeling ambitious? December is perfect for the Library Advent Calendar: 25 days of exciting things about the library! 5. Are your patrons traveling? It is the perfect time to check out an audiobook! 6. For those of you offering Food for Fines, share great articles of long overdue books! 7. Highlight your movie collection by creating a holiday movie madness bracket! 8. Did you know December 8th is national brownie day? What a good day to showcase your recipe book collection! 10. Encourage patrons to play the "Grab the Nearest Book" game for the New Year. They need to grab the nearest book, turn to page 24, and post the first adjective you read. 11. Create an infograph about New Year Resolutions and your library card! Found these ideas useful? Join The Shareable Clique!